Since launching last February, For Honor has gone through a lot of changes. Ubisoft has added new heroes and maps, run several limited-time events, and created dedicated servers. A new featurette Ubisoft has released on the game says For Honor is only going to keep going, and there’s a tease for another new hero at the end. The full featurette can be seen below. In it, the For Honor development team discusses some of their early missteps and how they’ve worked to respond to their players’ feedback since launch. Obviously as a piece of promotional material, it’s meant to get people excited to play the game, but the developers do talk about how decisions they made early on didn’t always pan out. Looking for a fight? Then check out our list of the best multiplayer games on PC. 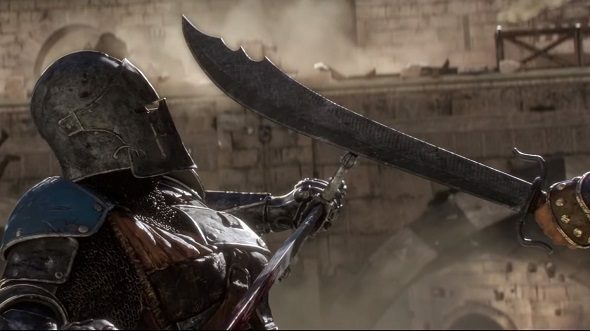 After talking about where they want to take For Honor going forward, they provide a quick tease: A clip shows a Warden, one of the Knight characters, spinning around to meet an incoming strike from an unseen enemy. All we get to see is a sword, stopping just inches short of the Warden’s chest. It’s a curved, saber-type weapon, with cutouts on the non-edged side of the blade. The hilts are asymmetrical, with the leading side bending down and the other bending up. The hand holding it appears to have a studded leather piece protecting it. Here’s the full featurette. Skip to 4:24 for the quick teaser. There are a couple possibilities. The sword could be a falchion, a machete-style sword used in medieval Europe. That would indicate a new hero for the Knights faction. But to me it looks more like a dadao, a wide, single-edged war sword that rose to prominence in China during the Three Kingdoms period. The dadao (which translates to ‘big knife’) is often styled with the reversed hilts shown in the teaser video. For Honor doesn’t have a Chinese faction, but they’ve made accomodations for poetic license before, adding the RomanCenturion and Gladiator to the Knights’ roster. Odds are good that there’s a new Chinese hero coming to the Samurai faction, and the little bit of armor visible seems to support that theory. Ubisoft will undoubtedly have more to say about it at E3.